Lim Ai Hooi is a highly recognised and respected conductor and educator in the Singapore and international choral scene. Among the numerous accolades she has received, the most notable are in leading the Hwa Chong Institution Choir to emerge Champion in the Mixed Choir category at the 5th World Choir Games 2008, achieving the title Absolute Winner (top choir across categories) at the Festival of Songs Olomouc, and the Prix du public (Public prize) at the 2010 Florilège vocal de Tour. 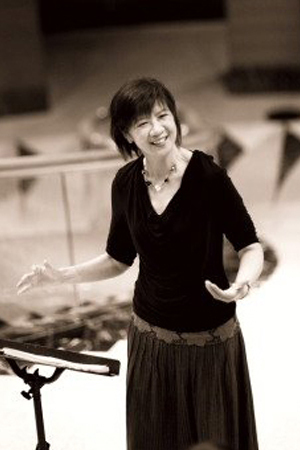 Ai Hooi’s philosophy for choral music and teaching stems from her view that a fulfilling musical journey is one that is filled with sincerity, love and excellence. She uses the creation of music as a platform to share and infuse her values and beliefs in her singers, and inspires them to use the beauty of music to craft experiences that touch the hearts of the audience. Ai Hooi actively contributes to the growth of the local choral scene, through nurturing younger choral conductors and choristers. On top of conducting several local secondary and junior college choirs, Ai Hooi established ONE Chamber Choir, a young adult choir. ONE entered into a partnership with the Song Lovers Choral Society in 2010 (formerly known as Lee Howe Choral Society), to form its youth wing. Since its establishment, ONE has presented unique experiences to its audiences through challenging conventional choral performances and exploring new dimensions to choral delivery under the artistic leadership and vision of Ai Hooi. Ai Hooi also co-founded Sourcewerkz PL to further her calling to teach, touch and transform the larger choral community and its audience. To date, Sourcewerkz has organised the Winter Choral Festival in Hong Kong since 2010 and the Portuguese Summer Choral Festival since 2012, as well as various workshops with international choral clinicians. In 2014, she conceptualised and will direct the 1st Singapore International Choral Festival to be held from 21 – 24 August.